Let's Encrypt has achieved another big milestone by issuing 1 million free Transport Layer Security (TLS) SSL Certificates to webmasters who wish to secure the communications between their users and domains. Let's Encrypt – operated by the Internet Security Research Group (ISRG) – is an absolutely free, and open source certificate authority recognized by all major browsers, including Google's Chrome, Mozilla's Firefox and Microsoft's Internet Explorer. 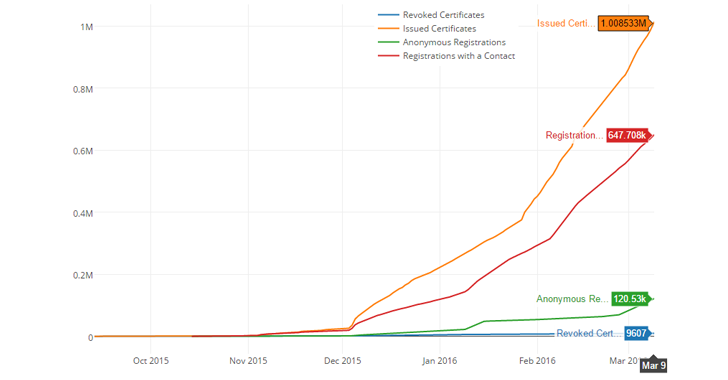 It is just three months and five days since Let's Encrypt launched a beta version of the service, and the group has crossed 1 Million certificates in use across the Web, Let's Encrypt said in a blog post on Tuesday. Let's Encrypt allows anyone to obtain Free SSL/TLS (Secure Socket Layer/Transport Layer Security) certificates for their web servers. Backed by companies including EFF, Akamai and Mozilla, the Let's Encrypt project started offering Free HTTPS certs to everyone from last December. Let's Encrypt certificates are configured with cross-signatures from SSL cert provider IdenTrust, making its free certs trustworthy and allowing users to browse more securely on the Internet. With Let's Encrypt, it is very easy for anyone to set up an HTTPS website in a few simple steps (Here's How to Install Free SSL Cert). "Much more work remains to be done before the Internet is free from insecure protocols, but this is substantial and rapid progress. It is clear that the cost and bureaucracy of obtaining certificates was forcing many websites to continue with the insecure HTTP protocol, long after we've known that HTTPS needs to be the default. We're very proud to be seeing that change, and helping to create a future in which newly provisioned websites are automatically secure and encrypted." Let's Encrypt had signed its First free HTTPS certificate in September, and its client software emerged in early November. Also Read: Hackers Install Free SSL Certs from Let's Encrypt On Malicious Web Sites. So, now it's time for the Internet to take a significant step forward towards security and privacy. With Let's Encrypt, the team wants HTTPS becomes the default and to make that possible for everyone, it had built Let's Encrypt in such a way that it is easy to obtain and manage.